The working day of the European Union Advisory Mission’s (EUAM) started differently today. Over 150 staff members joined the сampaign marking the International Day for the Elimination of Violence against Women (EVAW). 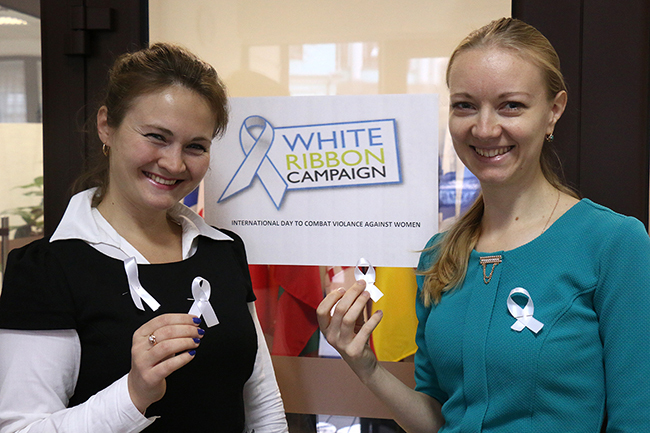 Whilst entering the EUAM’s Headquarters in Kyiv, the personnel was offered to pin a white ribbon as a symbol of their intolerance to violence against women and girls. According to the United Nations, 35 percent of women and girls globally experience some form of physical and or sexual violence in their lifetime with up to seven in ten women facing abuse in some countries. The numbers in Ukraine show that every second woman has experienced domestic violence. 30 percent of girls faces abuse before the age of 18. The costs and consequence of violence against women last for generations.